Raul Ramirez, Jr. rides Pyc Pick Your Pocket to her first career stakes win in the Adequan Prairie Meadows Derby Challenge(G3) on Saturday. ALTOONA, IA�SEPTEMBER 14, 2013�Leading sire PYC PAINT YOUR WAGON sired two more finalists Saturday night to the Bank of America Challenge Championship Night schedule for November 9 at Los Alamitos Race Course. The annual Championship Night of racing will be held during the annual AQHA Racing Conference scheduled November 7-9 in Cypress, California. Miguel Banuelos' Pyc Pick Your Pocket rallied strongly to catch Heroes Heart by a neck in the $43,110 Adequan Prairie Meadows Derby Challenge(G3) Saturday night. Sooner Country Babe finished three-quarter back in the show position. Jockey Raul Ramirez, Jr. rode Pyc Pick Your Pocket to her first stakes win while covering the 400 yards in :19.822 seconds, a 93 speed index, into a 15 mph headwind. The $19,831 winners purse pushed her career earnings to $37,167. Jose Ibarra trains the Oklahoma-bred daughter of leading sire PYC PAINT YOUR WAGON out of Bold Aldebaran, by Bold Episode. Sammy Hester is the breeder. Pyc Pick Your Pocket also earned a starter spot in the $200,000 Guaranteed Adequan Derby Challenge Championship(G2) on November 9 on Bank of America Challenge Championship Night at Los Alamitos Race Course. Last year's John Deere Juvenile Challenge Championship(G2) winner Heros Heart finished second for owner Horton Racing, LLC. Charlton Hunt trains the filly . Ridden by Stormy Smith, Heros Heart earned $8,622 for the effort. Sooner Country Babe's third place effort broke a three-race win streak for the filly. Stacy Charette-Hill trains the homebred for David Rath. Jorge Torres was up to earn $4,311. Completing the field were Dash Master Jess, Hastabealeader, Outlaw Memories, Snowy Vengeance, Also A Feature, Ianna and Tygers Painted Girl. Christie and Mikel Donahue's homebred Corona Mit Go punched her ticket for California Saturday night following a powerful effort to win the $30,$510 Merial Prairie Meadows Distaff Challenge by three-quarters over Im A Feature Girl. Girls Dont Seis finished a head back in third. Third at the break, jockey Jorge Torres hustled Corona Mit Go to her sixth career win. The PYC PAINT YOUR WAGON 4-year-old completed the 400 yards in :19.998 seconds into a 10 mph head wind. The victory was worth $14,035 as well as getting her starting spot in the $100,000 Guaranteed Merial Distaff Challenge Championship(G1) at Los Alamitos Race Course November 9. 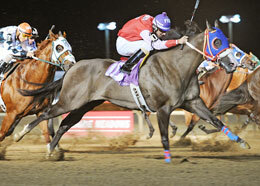 Ima Feature Girl rallied to finish second for owner Jorge Haddad and trainer Brent Clay. J.E. III, D.C. and C.T. Jumonville bred the mare in Louisiana. Ridden by Berkley Packer she earned $6,102 for the effort. Coming off an allowance win on August 9 at Canterbury Park, Girls Dont Seis put in a good effort for owner Merrit Pride and John Witte. The 3-year-old is bred and trained by Pride and ridden by Doug Frink. Feelin The Fever, Notdonebaby, Miss Jp Washer, Painted Sable, Alteza, Ms Jesse Belle and Whos de Winna completed the field.